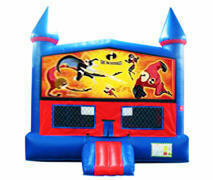 Kids of all ages will enjoy this 15 x 15 x 14 Incredibles fun jump! Your kids love the “Supers”, which are humans with superpowers and the family of Bob and Helen Parr, their kids Violet, Dash, and Jack-Jack. Bouncing Buddies rents The Incredibles fun jump in Lafayette and surrounding Acadiana areas.